Immune boosting tea is part of my arsenal to keep the family healthy during the cold and flu season. It is great to sip on during an illness but I like to drink it as a preventative measure too. After brewing you can mix in a bit of raw honey or a few drops liquid stevia to sweeten it, if you prefer. The great thing about this immune boosting tea is that it can be served hot or cold; and you can make it ahead of time and keep it in the fridge to enjoy over a few days. 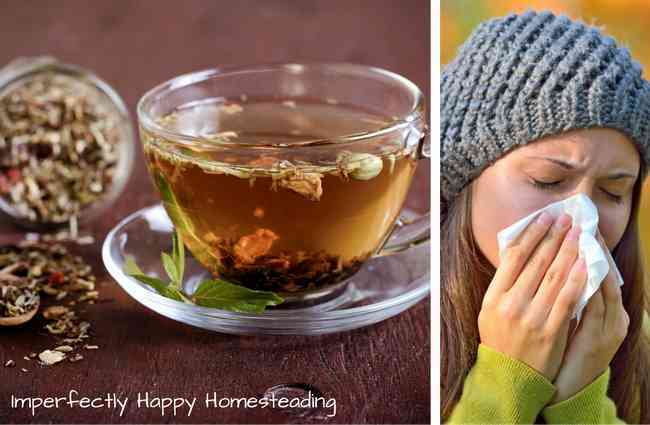 The ingredients for this immune boosting tea were put together for their high-c content, anti-viral properties and their ability to support the immune system. You can play around with the ingredients a bit for flavor but I highly recommend this blend as is. This recipe is given in parts instead of a particular measurement; for example if 1 part = 1 ounce then a 1/2 part would equal a 1/2 ounce and so on. This gives you room to make a large batch or just enough for a single serving. I always try to use organic ingredients, especially in a medicinal tea. Elderberries are known to boost the immune system, aid in healing coughs, colds, flu, bacterial and viral infections and even tonsillitis. Higher in vitamin C than an orange, rosehip berries also contain vitamin A. They are know to benefit the immune system, help to prevent infections (bacterial and viral). Rosehip also helps to fight off any infections when we’ve already caught something. Lemongrass has antibacterial, anti-fungal and antimicrobial properties. It can benefit the respiratory system, fevers, aches, and infections. Ginger root has more health benefits than I can list here. But for the purposes of immunity, ginger root aids a compromised immune system and can improve respiratory function. Not to mention if you’re feeling a little sick to your stomach, ginger root can settle it. Besides adding lovely flavor to the tea, cinnamon an antioxidant, anti-microbial and immunity-boosting. If you’re going to make a large batch you want to combine them in a large glass jar, make sure to leave room to give it a gentle shake to mix it up (or mix in a bowl first). If you are going to make single servings you may want to use an individual infuser; just make sure to give the herbs a final push at the end to get all the tea out. You want about 1 tablespoon of the tea mixture for every 8 ounces of water. Strain your herbs, pour in a mug and enjoy! If you make a large batch you can refrigerate it and warm it up as needed. You can drink the tea cold but you do miss out on breathing in the medicinal vapors that a hot tea provides. You can enjoy 2 or 3 cups a day of this immune boosting tea during a cold or to prevent illness.